KANSAS CITY, Kan. — A faithful family, a love for the Mass and a boyhood desire to become a priest are good indicators that a young man could be called to the priesthood — but it’s no guarantee. Such was the case for Deacon Nicholas Steven Ashmore. As he discovered, discernment is a gradual process and requires making decisions between equally good choices. Deacon Ashmore, like all seminarians had to confront this question: What does my heart really desire? Deacon Ashmore, who will be 26 years old when he is ordained, was born in Rochester, New York. He and his twin brother Robert were the third youngest of the nine children of Willard Ashmore and Katrina Gavala. Due to his father’s work as a nuclear operations expert, the family moved around a bit. Deacon Ashmore’s family moved to Michigan when he was 6; to Burlington when he was 7; and then Mars, Pennsylvania (near Pittsburgh) when he was 14 years old. His father was a cradle Catholic, and his mother converted to the Catholic faith in the early 1990s. His time in Kansas was particularly influential. Deacon Ashmore went to St. Joseph School in Olpie, and his mother cooked there, too. An additional influence was to be found in his pastor, Father Michael Hawken. “I had a wonderful example of a parish priest in Father Hawken, and I wanted to be like him,” said Deacon Ashmore. 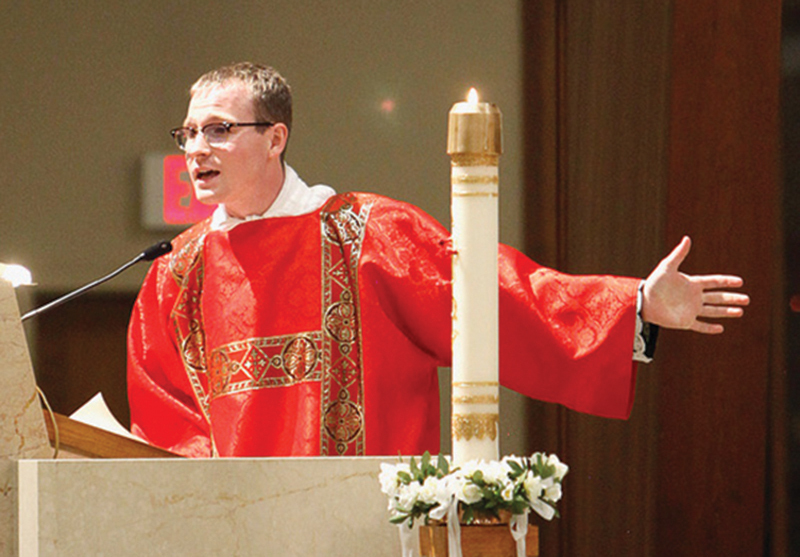 It was about the time he was an altar server that Deacon Ashmore met another great role model — through a book. There was a book fair at St. Joseph School, and Deacon Ashmore — an avid reader — was eager to go. He talked about the book with the friendly lady in charge. Sadly, he began to put it back. When she found out he had no money, she gave it to him. Deacon Ashmore excitedly took it home, showed it to his parents and finished it that night in bed with a flashlight. And he read it through three or four times again by next week. Later, as a middle-schooler, he found a “home away from home” at Conception Seminary’s Companion Camp, an event hosted by the seminary in Conception, Missouri, and focused on faith, fun and fellowship. In high school, he explored other avenues as well. The desire to be a priest remained, but he developed an interest in music. He sang, played the French horn and participated in musical theater. He took voice lessons and his teacher encouraged him to pursue a career in classical voice. He liked performance, the art of the stage. But he didn’t crave applause, the glory of the stage. He felt empty when the applause faded. “And, so, I realized that I wanted something that would last, something that wasn’t based around me, something that was based around others,” said Deacon Ashmore. “I realized that only in being a gift for the sake of the people of God could I be happy. After graduating from high school in 2011, Deacon Ashmore went on to Conception Seminary College. Later, he went to Kenrick-Glennon Seminary in St. Louis. Every year since then, he has evaluated his call, and every year has received affirmation. He was ordained a deacon by Archbishop Joseph F. Naumann on May 19, 2018, at Holy Trinity Parish in Lenexa. He will be ordained a priest by Archbishop Naumann on May 25 at Church of the Ascension in Overland Park. What advice would he give to men discerning the priesthood? “Don’t try to ‘figure out’ your vocation,” he said. “Rather, put your heart in Jesus’ hands, and trust that he will guide you wherever you go. Tech I can’t live without: Life without my MacBook would certainly demand some sacrifices. Favorite devotion:The rosary. My father passed down a deep devotion to the Blessed Mother through this beautiful prayer. I have only grown to love it more in my time in formation. Book to recommend:“The Confessions of St. Augustine,” by St. Augustine of Hippo. I read it every year. It has everything: love, friendship, intrigue, heartbreak and that mystical yearning we have deep within for the eternal and loving God. Least favorite food: This will be controversial: lasagna. Never have I grown a taste for it. Dream vacation:A combination of relaxation, sightseeing and spending time with friends. My hidden talent/party trick:I have above-average control of both eyebrows. Best advice I’ve received seeking my vocation:Discernment is a process of trust; it does not happen overnight. I met Deacon Nicholas in Life Teen during his high school years. It was apparent to me, almost from the first time I met him, that he had a heart for Christ and a desire to serve Christ and His Church. Deacon Nicholas (soon to be Father Nickolas) had, early in his teen years, a mature and deep faith, far beyond his years. I remember being blown away by his faith and knowledge, his true love of the Church and it’s teaching. It was then that I start praying that he discern the priesthood. He is in my daily prayers and always will be. What a wonderful gift it would be to have more young men like Nickolas in our seminaries!